Happy Sunday everyone! This is one event that I just had to take part in. You know I’ve been on board with trying to eliminate all unprocessed foods for my family and I. I feel strongly about this however my daughter is the one I have left to work on! This brilliant theme is being hosted by the fabulous DB over at Crazy Foodie Stunts. Thanks for hosting DB! Everyone has their own definition of what “Unprocessed” really means. Andrew over at Eating Rules set up an October pledge. To find out more about it head on over and see how he lays it out. I like his definition because it’s simple, he calls it the “Kitchen Test.” If you pick up an item and look at the ingredients (If it doesn’t have a label, most likely it is unprocessed!) you are looking to see if you can actually make that item in your own kitchen, it doesn’t mean you have to, it just means if you can, it’s unprocessed. If you see an ingredient listed that you could not make in your own kitchen or from it’s original form then most likely it’s processed. Simple enough for me. I have a long ways to go but any where is a start right? I make my own cream of mushroom soup, salad dressings and pesto or pasta sauces. I always keep an eye on sodium levels because we all like quick and easy meals but sometimes processed versions are loaded with sodium. Eating healthier and unprocessed on the go can be done guys. I made this recipe on a Friday as we were headed out for a weekend of camping. Though we had great accommodations consisting of a full stove and fridge, I like to relax while camping. In my years growing up and going camping with friends we always tend to grab for the prepackaged pasta salads and burgers. I plan my menus so my family and I can stay on track. I made the turkey mixture in this recipe before we left, bagged it, cooked the sweet potatoes on our grill one night, warmed up the mixture and topped the sweet potatoes for a delicious, unprocessed yet easy meal! Oven: Preheat oven to 375F. Pierce the sweet potatoes and place directly on oven racks. Bake for 40 min. Grill: Set grill to Medium heat. Wrap sweet potatoes in tinfoil. Pierce with a fork and cook for 40 min turning them a few times. Add the oil to a sauté pan and onion for a few minutes. Add garlic and sautee for a few more minutes. Add ground turkey breaking it up. Once the turkey is almost cooked through add the mushrooms and cook for a few more minutes until mushrooms have softened. Add salt and pepper to your liking. I’m super excited to see what the Sunday Supper team has brought to the table today because I want to put more of these kinds of recipes on my menu! Slice the sweet potatoes in half. Place the turkey mixture on the potato and top with shredded cheese. Serve with your favorite veggie for a complete meal! Now it’s time to get other ideas for unprocessed dishes! I’m super excited to put some of these recipes on my must make list! 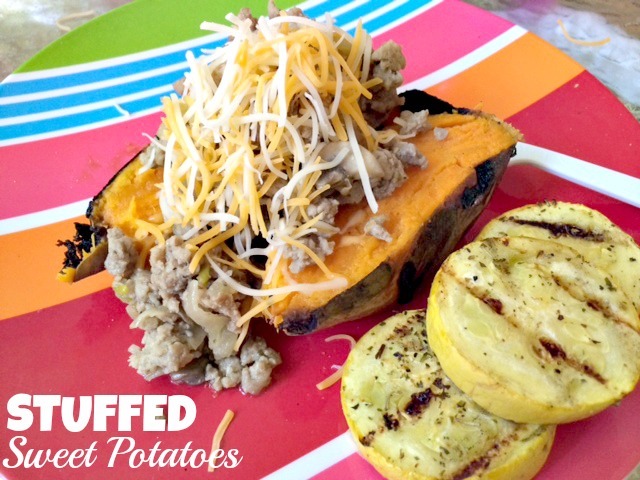 Turkey and sweet potatoes are a winning combo! And nice to see a savory stuffed sweet potato too. This sounds like a great lunch or dinner combo! Oooh, I love your filling! Looks like one delicious meal! I used to make a vegan version of this all the time! No clue why I stopped really! This looks fantastic. I don’t make sweet potatoes nearly enough! I never tried mushrooms and sweets, interesting combo! Ummmmm yes please! 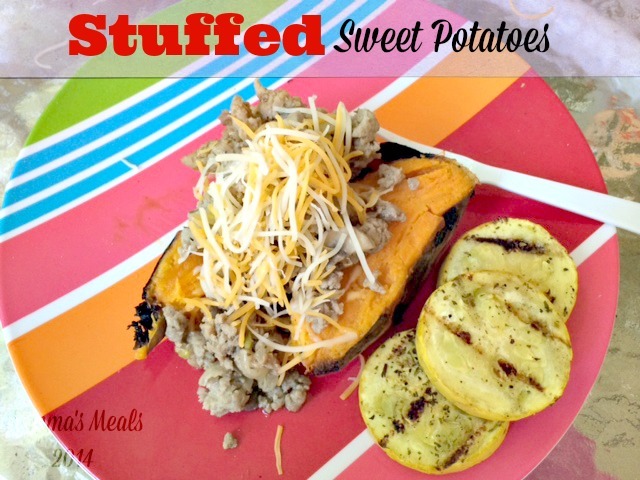 Stuffed sweet potatoes?! This is love at first bite for sure, Tammi. Thanks for sharing this! Impressed that you prepared this as you were heading out the door. It looks great!